BEIJING — The sister of President Donald Trump's son-in-law Jared Kushner has been in China courting individual investors with a much-criticized federal visa program that provides a path toward obtaining U.S. green cards. Kushner's sister Nicole Meyer promoted 1 Journal Square, a Kushner Companies' development in Jersey City, at an event Sunday at the Four Seasons Hotel in Shanghai, according to participants. The pitch seeks to raise funds from Chinese investors through the U.S. government's EB-5 visa program, which allows permanent U.S. residency for those who finance projects that create a certain amount of jobs. 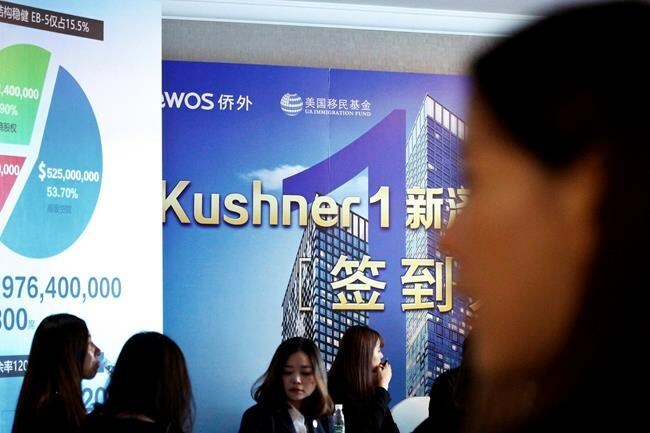 The event was organized by Beijing-based immigration services company QWOS and Kushner Companies, according to an advertisement on the Chinese company's website, which says the project is seeking $150 million from 300 EB-5 investors. Kushner, a senior adviser to Trump, stepped down as chief executive of the Kushner Companies in January and has sold stakes in several properties to help allay concerns about conflict of interest. His family's promotional efforts in China come amid widespread criticism of the EB-5 visa program, which has grown popular among wealthy foreigners seeking to move to the U.S. but faces allegations of fraud and misuse. Critics say many of the investments purportedly aimed at assisting poor areas of the U.S. have instead wound up going to projects in more affluent neighbourhoods, while many programs have been badly hit by fraud scandals. U.S. lawmakers have been weighing proposed changes to the program, which would likely affect companies such as Kushner Cos. should it want to raise funds from such investors. Earlier this month, Congress extended the EB-5 program in its current form through Sept. 30. Staffers at QWOS' offices in Beijing and Shanghai either refused to comment or did not answer repeated calls. There was no immediate response to a request for comment emailed to Kushner Companies Sunday. Now led by Kushner's relatives, the Kushner Companies had earlier been negotiating with China's Anbang Insurance Group to provide what could be hundreds of millions of dollars in equity for redevelopment of a Manhattan office building. Those negotiations, which had drawn criticism from lawmakers and government ethics experts, ended in March. Critics saw it as a potential attempt by China to curry favour with the White House. The Chinese company's advertisements for the Journal Square development described the project as "Kushner 1," with punchy subtitles declaring that it has "government support" and is "founded by celebrity developers," without elaborating. Bi Ting, a 34-year-old woman who attended the Shanghai event, said that having the name of the U.S. president's son-in-law on it was "a bonus for the project." Bi said Kushner's sister Meyer spoke for more than 10 minutes, describing the history of the Kushner family and the highlights of the project. Meyer spoke to the audience in English, aided by a translator, and didn't take any questions, Bi said. The proposed EB-5 investment would account for around 15 per cent of the total investment of $976 million required for the project. According to QWOS's advertisements, the development comprises two 66-story towers of 1,476 luxury apartments, as well as commercial and retail space. Another person who attended the forum in Shanghai, who would only give her surname, Wang, said people in the conference said that Trump's son-in-law was a shareholder of the Kushner Companies, but "he has already quit." "I don't know if the connection with the president is good or not, it's hard to say," added Wang, who is from Shanghai. The other participant, Bi, who is pregnant, said she was considering immigrating to America to give her child an academic environment that is "more relaxing; where one can pursue real interests and where the child can do something that they really want to do." Organizers prevented reporters from attending the event, saying it was a private function even though it is publicly advertised. On Saturday, Meyer spoke at a similar promotional conference in Beijing, details of which were first reported by the Washington Post and the New York Times. Associated Press researchers Fu Ting in Shanghai and Henry Hou in Beijing contributed to this report.